Local bed and breakfasts (B&Bs) offer a great accommodation option for campers and families visiting HOC Summer Camp. After living in Toronto, we moved here to build our dream home. It’s big with high cathedral ceilings, a gourmet kitchen, choice of 5 bedrooms (choose your favourite, 3 available at one time) all with en-suite bathrooms. 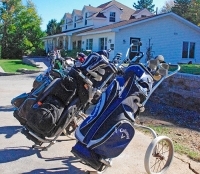 A challenging executive 9 hole golf course nestled at the top end of Sundridge, Ontario. The Ridge offers a fully licenced club house, banquet room, pro shop, and new for 2016 golf club storage and putting green. The Ridge also includes a new 2-3 Bedroom Bed and Breakfast option. Our rustic farmhouse has three available bedrooms and sleeps 6. Surrounded by forests and lakes, it makes for a quiet and peaceful getaway. Enjoy outdoor activities such as hiking, canoeing, x-country skiing, snowshoeing, fishing, hunting etc.